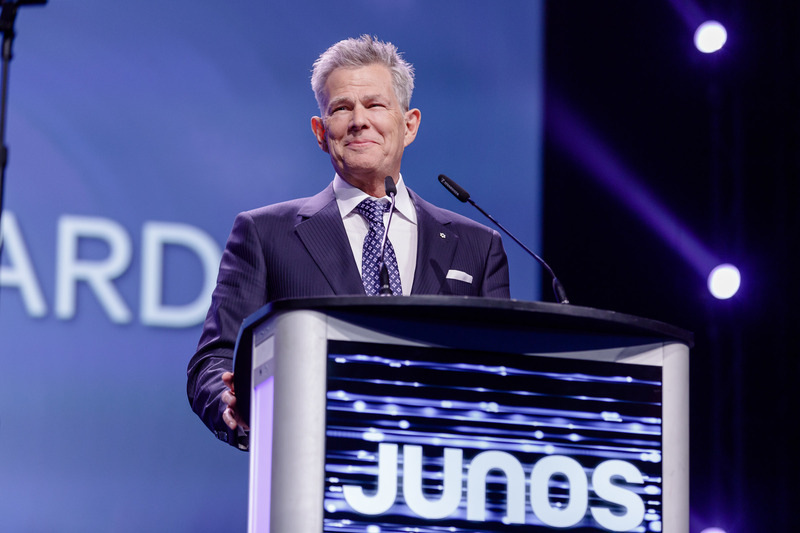 The David Foster Foundation is delighted to congratulate its founder, David Foster, on the recent announcement that he will be awarded the 2019 Humanitarian Award at the 48th JUNO Awards on March 17 in London, ON. Each year, a Canadian artist or industry leader is presented with this esteemed award that recognizes humanitarian efforts that have positively improved the social fabric of Canada and/ or whose impact can be felt worldwide. Recipients of this award, now in its 14th year, must show incredible dedication to social, environmental, and humanitarian causes. Foster is being recognized for his philanthropy and his support of hundreds of charities, including his own, The David Foster Foundation. David Foster is an internationally acclaimed music producer, composer, and song writer. His tremendous body of work includes creating hit songs for notable artists including Michael Buble, Celine Dion, Josh Groban, Madonna, Michael Jackson, and many more. Foster has won six JUNO awards, 16 Grammy Awards, an Emmy Award, a Golden Globe, and has received three Oscar nominations. In 1986, David Foster founded his namesake non-profit organization and to date, The David Foster Foundation has helped over 1,100 families. The Foundation supports and provides financial assistance to Canadian families with children in need of life-saving organ transplants. The Foundation also aims to raise public awareness about organ donation and registration in both Canada and the United States. The David Foster Foundation was created after Foster was deeply moved by a meeting with young girl in need of a liver transplant from his hometown of Victoria, BC. Knowing that he could make a difference and help save lives, he created The David Foster Foundation, and ensuring its success to help those in need has become a lifelong passion for him. As the foundation enters its 33 year, a new and ambitious plan is in place to grow the foundation and its reach exponentially. The David Foster Foundations will encourage increased organ donation registration through a national media campaign, a social campaign, outdoor advertising, and fundraising events with the goal to help even more families in need through the foundation’s future endowment fund. The David Foster Foundation provides financial assistance to families of children for all non-medical expenses while their child is going through the major organ transplant process. Thanks to its annual fundraising efforts and the generous support of Life Legacy Members, national partners, and donors, families receive financial support for day-to-day expenses such as mortgage/rent, car payments, travel expenses, utilities, groceries and more while their child is going through the major organ transplant process. The success of the David Foster Foundation would not be possible without the generous support of Life Legacy Members including the GAIN Group, Jim Pattison, TELUS, The Slaight Family Foundation, Parq Vancouver, Jim & Sandi Treliving and the Newton Glassman Foundation in Partnership with the Catalyst Capital Group. The Foundation is also supported by national partners WestJet, Aird & Berlis LLP, Honda Canada Foundation, Schnitzer Steel and OUTFRONT Media, and community partners Boston Pizza, Oak Bay Beach Hotel and Tom Lee Music. For those who wish to have a deeper involvement with the organization, there are a number of ways to contribute including the donation of RBC Rewards and Aeroplan miles, all of which will directly help families going through the organ transplant process. The Foundation also promotes organ donor awareness and registration in both Canada and the United States. For more information, visit www.davidfosterfoundation.com.